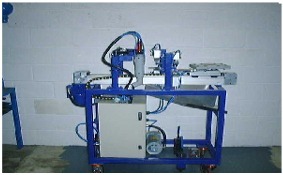 Fully automatic de-gating and de-flashing machine, sits inside a safety cell and is fed with twin impression fuel flap mouldings picked out of an injection moulding machine by a cartesian robot. It features a pair of location nests attached to a turntable which is also attached to a linear actuator; the assembly is mounted upon a robust chassis fitted with locking castors and lock down docking bolts. After fuel flap mouldings have been loaded to their respective nest, they are transported for de-gating and then transported for linishing along one side, then rotated and returned back for linishing along the opposite side, finally ending up where it started. The waiting robot is then informed to remove the finished parts.